Flatbush Avenue is the central artery of the borough of Brooklyn, carrying traffic 9.8 miles from Manhattan all the way to the Jamaica Bay out past the historic Floyd Bennett Field. 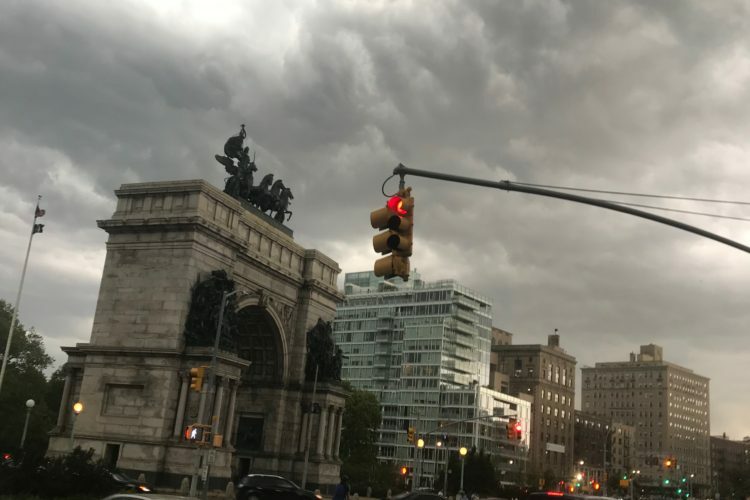 Flatbush Avenue was originally a Native American footpath that took advantage of a low point in the topography of the land, running roughly along what is now the eastern edge of Prospect Park. In the 17th century, a country lane was built over the footpath, connecting disparate Dutch farming villages, including Vlacke Bos, from which the avenue takes its name. In the 19th century, Flatbush assumed close to its present route, inland through the heart of a developing City of Brooklyn. This work was conducted under the auspices of the Jamaica and Brooklyn and Flatbush Plank Road Companies, authorized by the State Legislature to collect tolls on the Flatbush Turnpike. A consolidated company continued toll collecting until it went out of business in 1893. The Manhattan Bridge was completed in 1909, carrying increasing vehicular traffic between the boroughs of Manhattan and Brooklyn. As originally designed, Flatbush Avenue began at the foot of the bridge, emerging from the upper roadway between two massive granite pylons. In 1961, Robert Moses, in a move typical of the urban disregard that characterized his later career, destroyed the pylons in building the Brooklyn Queens Expressway. Since then, this part of the extension has strived to recapture its streetscape identity. In 2017, “Miss Brooklyn” & “Miss Manhattan” replica statues were reinstated to mark this significant portal. Still, as Flatbush traverses the rest of the borough, it moves past significant landmarks such as MetroTech Center, the Fulton Mall, the Brooklyn Academy of Music, the Long Island Rail Road‘s Atlantic Terminal, the Barclays Center, Grand Army Plaza, the Brooklyn Public Library, Prospect Park, The Flatbush Reformed Protestant Dutch Church, Brooklyn College, and Floyd Bennett Field, its diagonal pathway creating a unique street pattern and triangle shaped lots in every neighborhood it touches. Historic homes line the neighborhoods around the avenue, and a monument beside the former Flatbush Road, now inside the Prospect Park, commemorates an attempt to block the road during the Battle of Brooklyn, the first and largest battle of the Revolutionary War. 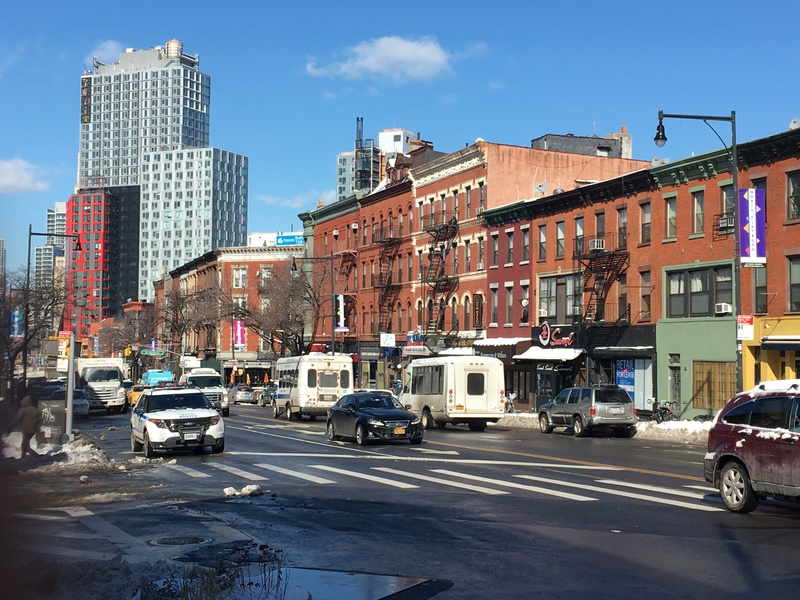 Flatbush Avenue has grown alongside Brooklyn itself, mirroring its development for more than 350 years of ongoing settlement, congestion, decay, renewal and reimagining. 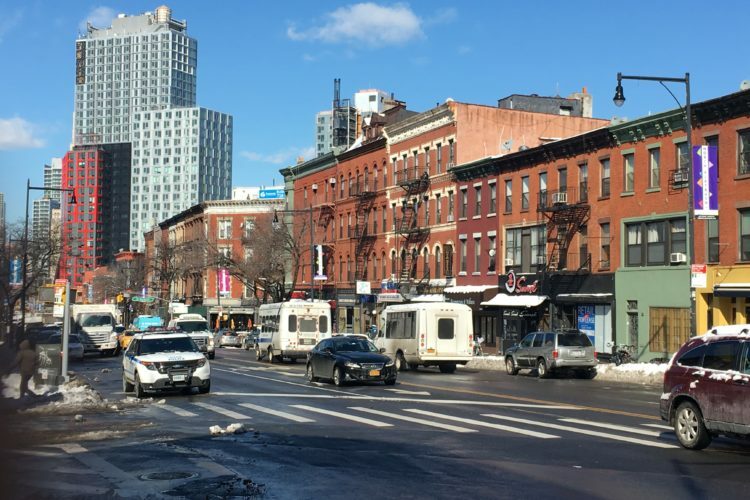 North Flatbush Avenue, which stretches from Grand Army Plaza to Barclays Center, where it goes on to connect to the Manhattan Bridge via the Flatbush Avenue Extension, is the border of Prospect Heights/Park Slope and a confluence of many diverse neighbors and cultures over time. North Flatbush Avenue is arguably the heart of Flatbush Avenue, and an important part of the lifeline of Brooklyn itself. 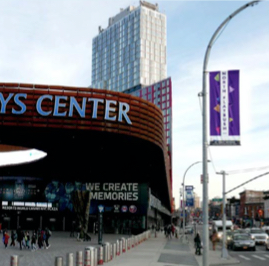 Notable to the changing demographics of North Flatbush is Barclays Center, which opened in 2012 at the corner of Flatbush and Atlantic Avenue, and now provides a grand iconographic landmark to the North Flatbush Business Improvement District. In its present form, the North Flatbush BID is bookended by two iconic representations of Brooklyn: Barclays Center to the North, and Grand Army Plaza/Prospect Park to the South. 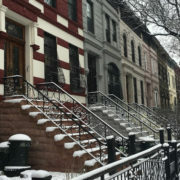 North Flatbush borders the historic districts of Park Slope (North) and Prospect Heights, as well as the emerging Pacific Park neighborhood. 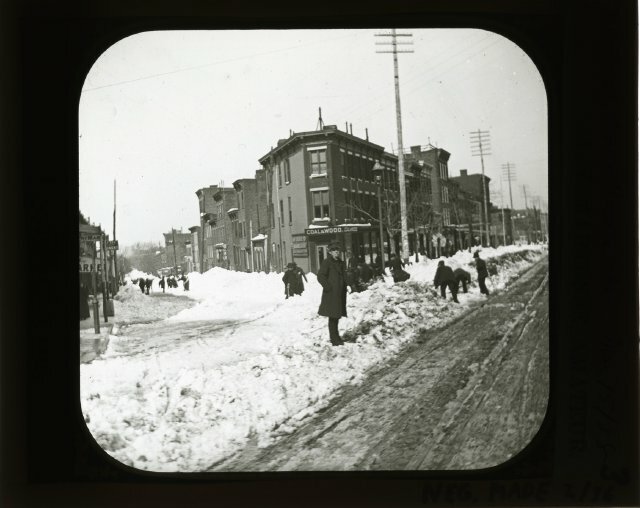 Since the North Flatbush BID was founded in 1986, we have seen the area undergo dramatic changes, with regards to both streetscape and demographics. We aim to be responsive to the changing needs of the business, local residents and community at large, while supporting the corridor in adapting to change while maintaining its diversity and vibrance. The Park Slope historic district is a National and NYC historic district consisting of over 2,800 contributing buildings built (approximately) between 1862 and 1920. In 2016, The NYC Landmarks Preservation Commission (LPC) designated an expansion of 292 buildings in the North Slope proximate to Flatbush Avenue. 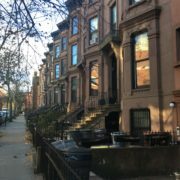 Already one of the largest historic districts, this represented ongoing efforts in preserving and protecting Park Slope’s vaunted historic character. Situated on the gentle slope leading up to Prospect Park, the neighborhood is mostly residential and hosts a cross-section of the important trends in American architecture of the late 19th and early 20th centuries–late Italianate, French Second Empire, neo-Grec, Victorian Gothic, Queen Anne and exceptional notable examples of Romanesque Revival houses. The Prospect Heights historic district, the fifth largest historic district in New York City, covers an area roughly bounded by Flatbush Avenue, Sterling Place, Washington Avenue, and St Marks Avenue. Prospect Heights hosted a diverse ethnic neighborhood in the 1910s through the 1960s, combining Italian, Irish, Jewish, German, Greek and Yankee residents, Prospect Heights became popular with the Haitian diaspora and is currently home to diverse families old and new. It is mainly comprised of many traditional 1890’s brownstone homes, townhouses, and Neo-Grec and Italianate row houses, but also includes larger multi-unit apartment buildings that are currently being considered for New York City landmark district status. A majority of Prospect Heights was listed on the National Register of Historic Places in 1983, was designated by the City Landmarks Preservation Commission on June 23rd, 2009, and was approved by the New York City Council on September 17th, 2009. Pacific Park is a mixed-use commercial and residential development project consisting of 17 high-rise buildings and 6,000 apartments under construction in Prospect Heights, adjacent to Downtown Brooklyn and Fort Greene. Pacific Park was originally dubbed Atlantic Yards by developer Forest City Ratner in 2003 for the old Long Island Railroad Train Yard along Atlantic Avenue over which part of the development is built, indicating a transition from manufacturing to residential. It was rebranded Pacific Park Brooklyn in 2014 for the park it is supposed to contain along a block of Pacific Street between Carlton and Vanderbilt avenues. 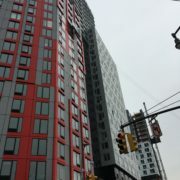 Pacific Park’s 461 Dean is the tallest modular building in the world – just one way Pacific Park is making history. This recently occupied 32-story tower designed by SHoP Architects will add to the neighborhood with 4,000 square feet of retail at its base and half of the 363 residencies designated affordable.